"This tattoo is the tail end of the sleeve on my left arm. It was done by Katja Ramirez (@katjaramirez), at Rock of Ages Tattoo (@rockofagestattoo) in Austin, Texas. The phoenix feathers are in the Japanese tradition, signaling rebirth, and the yellow flowers are Mexican marigolds, which light the way for the dead in Mexican tradition." The following poem, "Handihorse," is an unpublished work from the manuscript for Kathleen's 6th book, Lion's Paw. to kill anything anymore. Maybe a fish now and then. is what we are. Something wavers toward and we touch. Kathleen Peirce is the author of five collections of poems, most recently Vault, from New Michigan Press. Her work has been awarded The AWP Award, The Iowa Prize, and The William Carlos Williams Award, and was a finalist for The LA Times Book Award. Her work has been supported by the National Foundation for the Arts, The Giles Whiting Foundation, and the John Simon Guggenheim Foundation. She teaches poetry in MFA program at Texas State University. 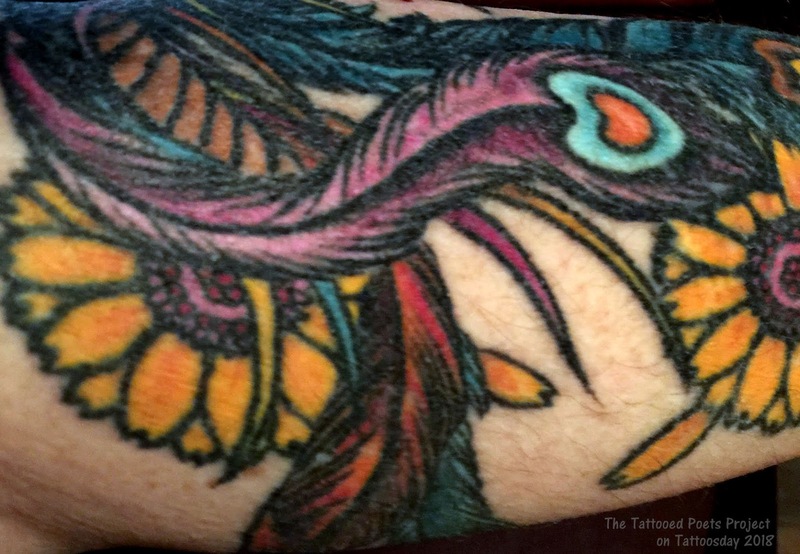 Thanks to Kathleen for her contribution to the Tattooed Poets Project on Tattoosday!